Modern smartwatches have to walk a delicate line between utility and distraction. Which side they fall on is often left to the whims of the wearer. I live on my phone. I work on my phone. It shouldn’t come as a shock that I’m glued to my wrist due to this, often with baited breath and an increased pulse waiting for the next email alert about a pending business deal. 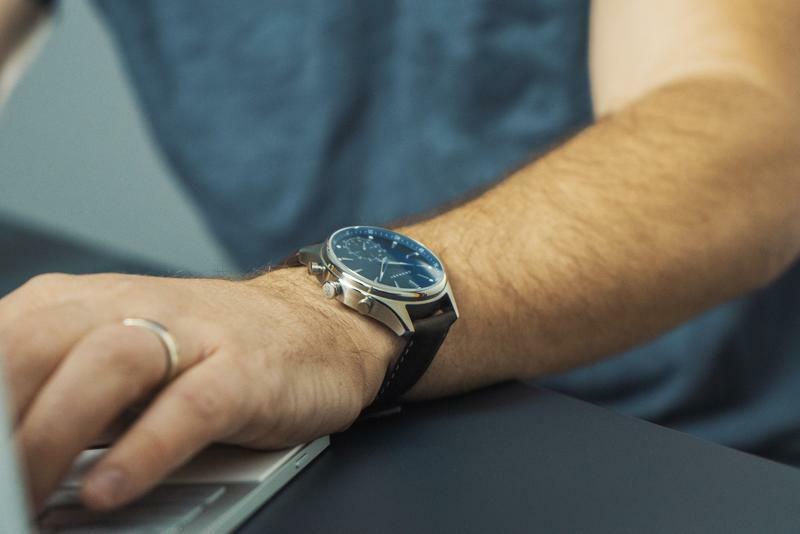 I live my life in a constant flux of anxiety, a situation made worse by the tiny screen on my wrist, that is, in essence, enabling what is becoming a growing technological addiction. 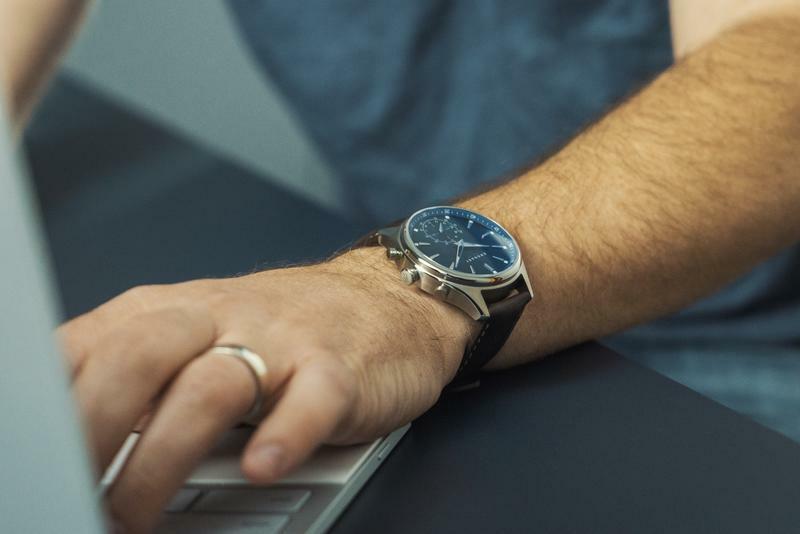 Enter Kronaby, a Swedish company that’s not shying away from the advances of modern technology but embracing it in a way that combines the utility of a smartwatch without the distraction. 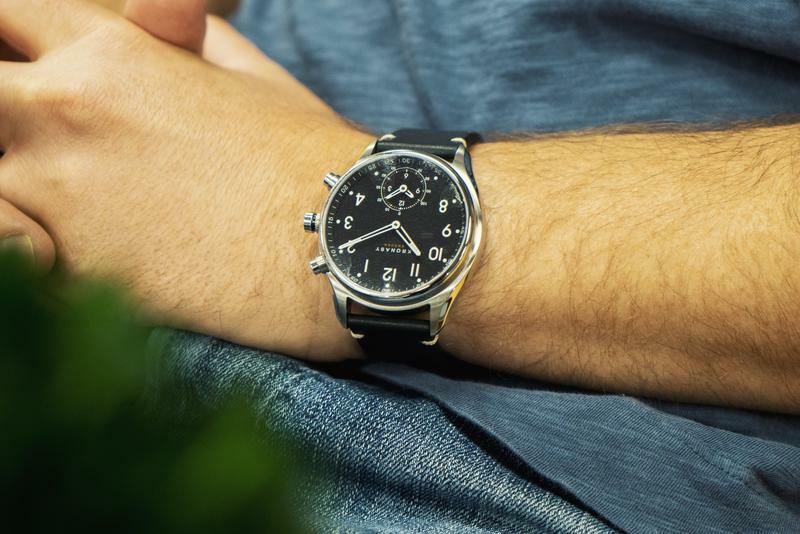 It’s a tough feat to pull off, but Kronaby is delivering a product with classic watch looks (and pedigree) with all the tech you’d expect in the 21st century. When Kronaby first presented me their product, (sorry Kronaby) I kind of rolled my eyes. I’ve heard this story before and been disappointed time and time again. I was assured that what was being offered was different. Skeptical, I agreed to look at the product, but only if I could speak to the co-founder. To my surprise, they agreed, and very quickly. That began a 30 minute Skype call with Sarandis Kalogeropoulos who explained the vision behind the company to me. They aren’t running from a smartwatch future but embracing it. What shocked me was the flat-out rejection that a smartwatch needs to be all screen and through its display can mimic a traditional watch. 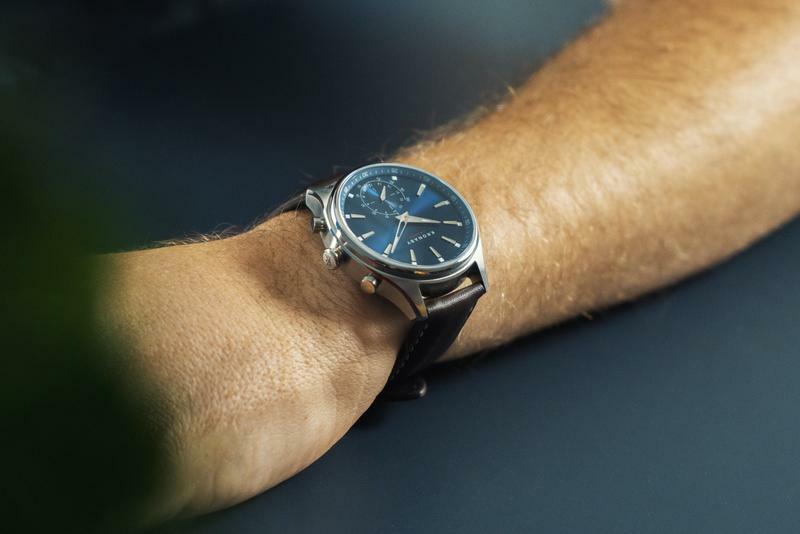 He feels a smartwatch can embrace its timepiece heritage while giving the user smart functionality. That was the driving force behind creating Kronaby. It’s a novel concept, and one, they actually succeeded in doing. For this piece, Kronaby sent me two watches: the Apex and a Sekel. Both look different, but like the company’s entire lineup, offer the same smart functionality. 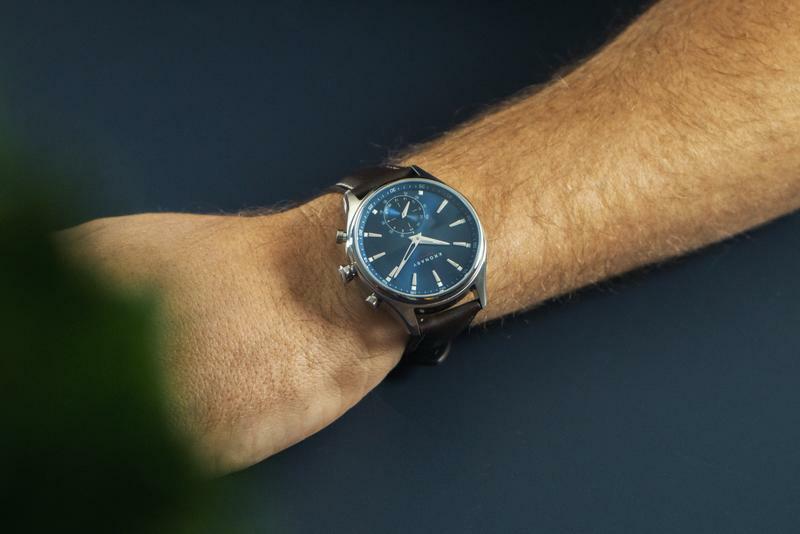 Essentially the lineup is a ‘hybrid smartwatch.’ And, like Sarandis explained, the goal is to create timeless watches that keep you connected without intruding on your life. 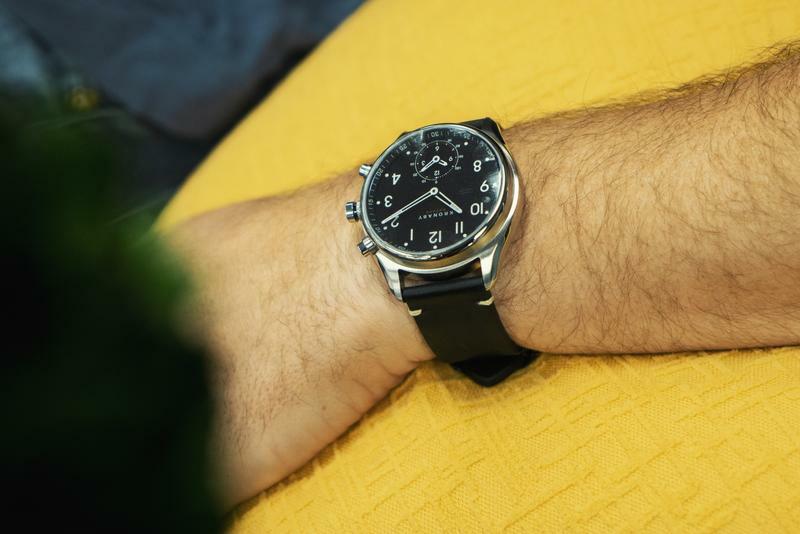 Let’s start with the actual watch part which has a very high-end analog look and feel, and is something you have really need to see in person to appreciate. Covering the face is a double domed sapphire display that gives the wearer a very clear, undistorted, view of the watch face. The case is made of stainless steel, and the dials and buttons emit a slight glow, allowing you to clearly see them in the dark. Water and watches are usually mortal enemies, but these timepieces can actually go as deep as 328 ft below water. To be clear, Kronaby doesn’t call them waterproof, but it is clear they can stand up to some unusual circumstances. These things can handle water. I bathed my kids every night for two weeks wearing them without even giving it a second thought, and without issue. 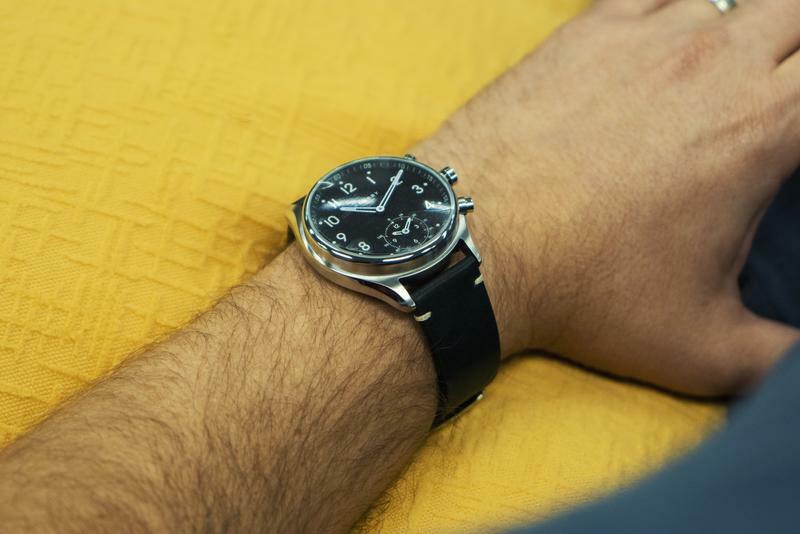 The craftsmanship is outstanding, the watch is comfortable without being a gigantic thing on your wrist, and, perhaps most importantly, it tells time. But that’s where things start to get interesting. You are probably wondering how a watch that looks, well, like a watch, can possibly have any smart features. This is where the genius is. Kronaby gives you three notification slots each representing 1, 2, and 3 o’clock. What that means, is when you configure the watch using its companion app (Android or iOS) you can set what actions the watch takes to alert you. Me, I set email to 1, so I get a single buzz on my wrist, and the hands immediately shift to 1 signifying the corresponding alert. When a text comes in, I have it set of 2, meaning it buzzes twice, and the hands go to 2 (they go back to the normal time after, don’t worry) and last, when a call comes in, it buzzes three times and goes to 3. It’s very simple in its elegance. I get the benefits of a smartwatch, without being glued to a screen, and it’s extremely refreshing. I can choose when to take out my phone and when to ignore it. Now, granted, I don’t know who the text is from, or who is calling, but not constantly seeing the flow of info has reduced my digital anxiety, something that was approaching an all-time high. The button cell battery inside never needs charging and can last up to two years. Unfortunately, it’s not user replaceable (to make sure gaskets keep the seal) so you will have to either send it in or take it to an approved location. The app features significant depth, letting you get as granular as adjusting the vibration intensity. I would have liked to see the remaining battery percentage somewhere in there, but it’s a small inconvenience. The three buttons on the side also add to the smart control and are fully customizable with options as well. Activities range from camera controls to stopwatch, to music controls and more. It actually took me a good three days to realize the watch actually has a full-featured pedometer built in, so I was able to track my movement and even set goals. 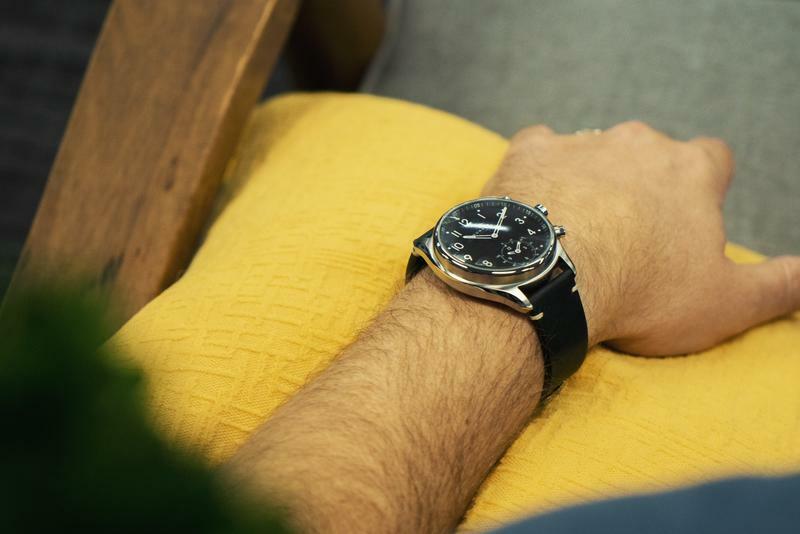 I’ve been really happy with my Kronaby watches, and I feel like I’m getting the style of a classic watch with the functionality of a smartwatch. And as an added bonus I don’t have the digital anxiety or needing to find a charger nightly. As I said at the beginning, it’s a difficult line to walk, but one Kronaby navigates with great alacrity. This type of form and convenience obviously doesn’t come cheap, with most prices residing in the $350-500 range, but when you consider what you are getting, the price starts to make a bit more sense. Is this the watch for you? I can’t tell you that, but what I can say with confidence is that it’s the right watch for me right now. If you are interested in checking out a Kronaby watch for yourself, they are available in stores nationwide. Check here for availability. Disclaimer: Kronaby sponsored this post but TechnoBuffalo had full editorial control.